Square Enix Music Online has posted a brand new INTERVIEW with composer Chance Thomas. OSV offers up their REVIEW of the Riders of Rohan soundtrack. Watch this new behind-the-scenes VIDEO. Really gives an idea of the work and effort required by so many to bring a score like this to life! MME website has posted a terrific VIDEO interview with Rohan composer Chance Thomas, cinematics director Mitch Cohen, cinematographer Scott Kevan and LOTRO lore master Chris Pierson. There's also a fun PODCAST interview with Chance, Merric and Goldenstar you can hear on the site Casual Stroll to Mordor. PC GAMER goes behind the scenes in this VIDEO interview with composer Chance Thomas. See several of the ancient instruments used in recording the ROHAN score (Hardanger, Baritone Guitar, Irish Flute, European Whistles, Bass Recorder). JOYSTIQ editor Justin Olivetti conducts and in-depth PRINT interview with composer Chance Thomas for Massively's recurring Jukebox feature. Includes a description of Thomas' writing studio and how he approaches scoring divergent simultaneous projects. 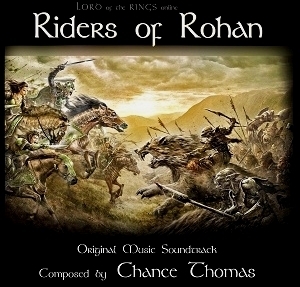 THE ONE RING.net has an introductory article in PRINT discussing the Riders of Rohan score. Includes several links to supplimentary sites, music samples and video. GAMES BEAT posts the first behind-the-scenes PRINT look at the Riders of Rohan music score recording process. Find out how chocolate and Baritone Guitar are connected! PC Gamer: "Magic with the orchestra… chords I can still hear in my head weeks later." IGN: "Memorable and powerful… you feel it in Chance Thomas’ haunting 22-track score." TenTonHammer: "An epic musical score worthy of the Rohirrim." CheatCodeCentral: "A breathtaking score that truly brings Rohan to life." GamingTrend: "The new soundtrack in Rohan is exceptional." I'll never forget my first hearing of the Rohan refrain composed by Howard Shore for 2002's The Two Towers. As the Hardanger melody rang out across the theater, I was completely mesmerized. This was the Rohan of my dreams, suddenly given voice in melody! It was stunningly, intuitively perfect. Of all the themes to be found running through Peter Jackson's trilogy, this one really resonated with me. Fast forward 10 years. LOTRO has tasked me with creating a theme for their Rohan, a new and different theme than Shore's. What? How is this possible??? Shore's theme was so perfect in the film. The only way I could approach such a task was to think about Rohan in broader terms than the movie presented. How does one broadly define Rohan? A storied nation in decline? A land simmering on the verge of all-out war? Anglo-Saxon reference with Medieval overtones? Hardy people, individual and family tenderness, triumph and tragedy, crops and kinships, determined men and women, though wary and weary? Nobility, hope, sadness and uncertainty? Yes, yes, yes, yes and yes! All of these intangibles somehow had to thread themselves through a new theme for Rohan. And so it begins. The theme is introduced on classical violin played in a Celtic fiddle style. The initial modality is minor, setting up the somber tone. The melody moves on hooks of appoggiatura, so prevalent in Old English music. This places the theme squarely in the Northwestern European tradition, tying it tightly to Tolkien's Anglo-Saxon source material. Other instruments join the theme, including European Whistle, Bass Recorder and Uillean Pipes. All of these colors come from Northwestern Europe of centuries past, clueing us again that the theme is contemporary to the rise of Anglo-Saxon culture. The progressing harmonies alternate between minor and major tonalities, suggesting the ongoing struggle of the Rohirrim. Triplet melodies against a 6/4 meter further reinforce the cultural resonance. As the theme approaches its apex, there is a triumphant modulation toward ultimate victory. And yet the resolve, though major, is a weak resolve (adding even a suspension to the chord) leaving a fragile uncertainty hanging in the air. 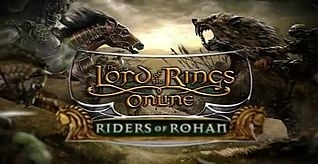 The new Main Theme for LORD OF THE RINGS ONLINE, specifically created for the Riders of Rohan expansion. Built from some of the game's most memorable themes, including the venerable old character select theme by Steve DiGregorio. "Magnificent! The homage to the older tracks is just excellent. I'm looking very much forward to the rest of the Rohan-soundtrack. If this is any indication, it won't disappoint..."
"I'm listening to this and the snippets of music from different races and moments in the game are flooding me with memories." "Love the music, it's awesome! Can't wait to hear more, it will be a truly immersive experience with this magnificent music to accompany me through Rohan." GENIOUS!! Then elven harp and dwarf bass and followed by men's orchestra as an ending : ) Cool... Nice mix-up!" "It's great to have Chance back. The influence he brings to the game through his music is what turns the quality of LotRO up to 11." "Awesome, I just love it! I can't wait to hear more!" "FORTH EORLINGAS! And bring that orchestra along too!" The music begins with a slow and slightly unfocused version of the Gondor theme played on French Horns and Uilleann Pipes, representing an erosion of Gondor's vision and leadership among the men of the West. The theme wants to rise in nobility, power, might and strength. We can hear it reaching, stretching, striving, even striking a stout cadence for a moment. But it cannot sustain! Stewards alone can never muster the stateliness necessary to bear off the theme (nor the world of men) in full splendor. Uilleann Pipes echo off into the distance, suggesting the long gone majesty that once was the throne of Gondor. And then, about 1:05 into the track, there is an injection of hope. We get a second rendition of Gondor's theme that's a little more focused, a little more pure, played on Penny Whistle and Uillean Pipes. The Penny Whistle represents Frodo. Frodo brings hope! The Pipes represent the past glories of Gondor's kings, embodied by Aragorn. The two instruments interlace and support one another, symbolic of how the fates of the two men are now unavoidably intertwined. There is a gently climactic rise toward hope, but then doubt as the Pipes and Penny Whistle echo off into an unknown future. And lest we forget that there's peril in the East Wall, we have the Bass Recorder, low drum and slightly dissonant strings to bring us back to present dangers. Nevertheless, the Horn and Whistle rise together one last time in unity and understanding, then ultimately continue apart as the Whistle (Frodo) quietly disappears and the Horn (Gondor) carries on resolutely toward Rohan. This track accompanies the player's first attempt at horseback riding in the game. It's basically a tutorial tune. Thus the gentle beginning, the gradually climbing harmonies, the simple arrangement, and the gradual tapering off at the end. It also marks our first introduction to Rohan's riding motif. The riding motif is typically played on the strings in the lower registers. It is a signature rhythmic riff that repeats at various points in the song. The idea is to convey a lively sense of galloping motion. The choice of low strings is due to the organic nature of the instruments. Their hollow wooden bodies resonate with a rich, natural energy in the lower registers. Not to mention the drawing of actual horse hair bows across the strings! To complement the strings, two differing sizes of Bohdran are added to the percussion ensemble - one with a 12" diameter and a tightly drawn head. The other is much larger, approx. 22" in diameter with a more loosely drawn head. Also unique to our equine percussion ensemble are a horse whip and leather strapping sounds. The fiddle takes on a prominent melodic role. The percussion and strings are loose and rustic. The brass adds girth to steady the arrangement. And when the song transitions from the timidity of learning to the joy of roaming freely, we bring in baritone guitar and mandolin too. All of these elements work together to help us perceive an ongoing sense of forward momentum -- mentally pulling us off the couch and into the saddle of our own fiery Rohirric steed. "This piece underscores the chaos of mounted combat. Tales of the American West sometimes included a reference to "waiting for the cavalry to come over the hill." In Rohan, that cavalry would be the Eored. Tolkien's Eoreds were groups of battle ready horsemen -- armored, armed and trained for war. They rode hard and fast into battle, and fought with ferocious intensity. Various references place their numbers at between 120 and 200 riders per group. This music track was written to accompany each player's own furious foray into full-tilt mounted combat. We're talking about full gallop with weapons brandished. Timid souls need not apply! The driving tempo and aggressive marcato strings kick the piece off with an intense immediacy. The choir joins in -- at times menacing and rugged, other times epic and regal. There's brass, percussion and woodwinds in the orchestra too, but their roles are generally supportive. We are bold (we sindon bald)! We are mighty (we sindon strang)! The Norcrofts is a complex part of the Eorlingas' world. Here dwell some of the most powerful and loyal of the king's men. Yet in dark contrast, players will find that intrigue and subterfuge are also afoot in this part of the horse realm. The music needs to reflect this dichotomy. We begin this song with an unfettered exposition of the Norcofts loyal theme in the horns and trombones, joined later by the fiddle. In the Old English tongue, the choir sings heartily of loyal warriors, spears, shields, swords, etc. But then comes a counter theme. Expounded boldly by a large horn section, it seems to announce its warning with gallant melancholy. When continued in the high strings and Bass Recorder it takes on an air of uneasiness and corruption, erasing loyalty from the senses. All the while the incessant tumbling of the riding rhythmic figure keeps things trotting (or galloping) along for the player. Such is our dichotomy! And so while the stout and hearty Norcroft theme has a prominent place in the track, there is plenty of uncertainty interwoven through counter melodies and dissonant harmonies. Even at the end, there is no clear resolution as we drone to an inconclusive conclusion with only percussion and double basses trembling on the tonic. As a side note, this track contains one of my favorite verses from The Two Towers: "Where now are the horse and the rider? Where is the horn that was blowing?" The Old English translation is: "Hwaer nú cwom hors ond hererinc? Hwaer cwom herehorn blawende?"" This track was composed to underscore the Boromir game instance, with players taking on the role of Boromir as he battles hordes of Uruk Hai in a desperate attempt to save Merry and Pippin. Boromir has his fatal flaw, as we all know. But this piece is not about that. This music is about Boromir at his most noble, determined and powerful. Big drums, epic choir, robust cadences and powerful statements in the brass all contribute to the feeling of strength and unwavering. After the choir sings, the Gondor theme makes its final appearance in this expansion. It is a resigned and somewhat naked version (meaning the arrangement thins out considerably) to underscore the utter aloneness of this great warrior-steward in his final mêlée. It repeats with a bit of forlorn (trumpets and high strings) before giving out to the brutal force of ragged low brass as the battle rages to its infamous conclusion. You may be interested to know what the choir is singing. The lyrics are in Old English, translated for me by Turbine's lore master Chris Pierson and his muse for all things Anglo-Saxon, professor Michael Drout of Wheaton College. The choir sings: Arë! Thrymnes! Fréot! Maegen! The translation is: Glory! Honor! Freedom! Power!